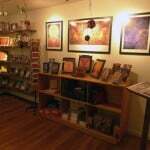 Art at CoSM features works by Alex Grey and Allyson Grey and includes the creations of many other visionary artists. At Grey House you can see Alex Grey’s beloved painting ”Cosmic Christ,” with it’s exquisitely hand-carved and painted frame. Clearly one of Grey’s most accomplished works, “Cosmic Christ” illuminates the story of humanity, a “garment of destiny” inscribed in a web of fire and eyes. Along with CoSM Christ, Grey House also exhibits many replicas of Alex’s most well-loved works plus numerous original oil paintings including Alex’s “Godself,” and “Planetary Prayer.” “World Soul” is a 700 lb. bronze sculpture, a four-faced hermaphrodidic dwarf with the paws of a lion, a fish’s tail and a six foot wing span on display in the gallery in Grey House. 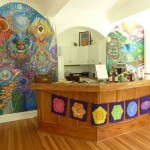 Inside Grey House, the visionary Victorian, artworks also include bronzes by Sukhi Barber, a resin suspension collage made especially for CoSM by Sebastian Wahl, a large bronze dreamcatcher by Grant Standard, plus paintings by Randal Roberts, Joness Jones and murals in The Mushroom Cafe by over a dozen accomplished Visionary artists whose works have been invited to join the collection. The framed Sacred Mirrors and many originals that are not currently on view will be exhibited in Entheon upon its completion and installation. 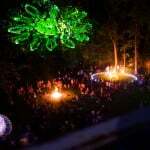 Gracing CoSM’s meadow is a major sculpture by Kate Raudenbush entitled “Altered States.” Created for Burning Man 2008, this white lace interactive masterwork of laser cut cold rolled steel, stands three stories high with a climbable balcony. 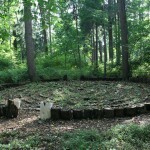 John Shook’s “deVine Man,” two human sized nests by Nature Hogan, and a beautiful labyrinth created by Calen Rayne can be found on the Wisdom Trail at CoSM.